Prema Gopalan has become the proud recipient of SEOY 2018 Award. The Award was presented by Rajiv Kumar, Vice Chairman, National Institution for Transforming India, NITI Aayog, in New Delhi. The SEOY Awards, founded by Schwab Foundation for Social Entrepreneurship, the sister organization of the World Economic Forum and the Jubilant Bhartia Foundation of Jubilant Bhartia Group, promotes social entrepreneurs in India by recognizing organizations that work to promote inclusive growth and contribute to bring change in the society through their entrepreneurial vision. This is a great milestone in the journey of Swayam Shikshan Prayog and a testimony to SSP’s tireless movement to empower each and every woman in the most vulnerable and marginalized regions of India to change her life and the lives around her. It is a moment of great Pride and honour for us to have Prema Gopalan receive 2018 Devi Awards from Hon'ble Chief Minister Devendra Fadnavis and Prabhu Chawla, Editorial Director of The New Indian Express. We would also like to congratulate other winners: conservation architect Abha Narain Lambah, pole artiste Aarifa Bhinderwala, Actor Bhumi Pednekar, educationist Deepali Gogate, entrepreneur Falguni Nayar, city chronicler Karishma Mehta, social activist Prema Gopalan, shooter Rahi Sarnobhat, policewoman Rekha Mishra and singer Rekha Bhardwaj. The Devi award is given to exceptional Indian women who display dynamism and innovation in their work, and who change the lives and lot of people around them through that work. The initiative was started in December 2014. The Devi events organized across the country honor women from different fields and different regions. So far honoured 168 women achievers across India have been honored. Chosen by the senior editorial team of The New Indian Express through a transparent methodology, the winners are decided based on the contribution they have made to their chosen line of work and to society in general. The Jubilant Bhartia Foundation and the Schwab Foundation for Social Entrepreneurship announced Prema Gopalan, Founder of SSP as one of the three finalists of the India Social Entrepreneur of the Year Award, 2018. The finalists for this prestigious Award were identified based on rigorous due diligence process. The SEOY India Award is given to the most remarkable change makers from the country - social entrepreneurs with a strong inclination towards addressing the most pertinent needs of the marginalised communities in both scalable and sustainable ways. The three finalists of 2018 are working with the Government as well as Private Partnerships to herald grass-root transformations, through their enterprise and sustainable models. Prema has made it to the finals for the second time. On the spotlight is her exceptional work in building a vibrant ecosystem for 1,45,000 grassroots women and SSP is honored on her behalf. Backed by Swayam Shikshan Prayog, these five women have taken to entrepreneurship, be it organic farming or rearing an indigenous breed of poultry. In the parched and cracked lands of Marathwada region, where water, land, and income are scarce, a few women have braved the odds. Mentored and supported by Pune-based NGO Swayam Shikshan Prayog, these women are using newer farming techniques to earn a living and charting inspiring tales of success. Click here to view more..
For her exceptional work in the field of climate community resilience, Godavari Dange of SSP received the Rama Govinda National Award 2018 on January 28. Godavari is a pioneer in the field of climate resilient agriculture, which promotes SSP's one-acre model of farming. She is the Secretary of Sakhi Federation in Maharashtra, and also the Director of Vijaya Sakhi Women-led Farmer Producer Company Osmanabad, Maharashtra, India. Godavari has been instrumental in disbursing funds worth more than Rs. 2.4 crores for food security, sustainable agriculture, water conservation, environment innovations and women-led enterprise towards building greater leadership of grassroots women. Godavari's achievements bear greater significance in the light of her past, a life forged in hardship. Hailing from a small village in one of the most climate-threatened regions in Maharashtra, India, Godavari spent her childhood guided by social norms. She stopped her education after standard VII and never left the house unaccompanied. She was married at the age of 15, and by the time she was in her early 20s, Godavari had become a mother of two and a widow. For a year, her intense grief left her with no strength to leave her bed, and no desire to keep living. Godavari's recovery was slow, but once she made a come back to life, she was determined to be strong. Her journey began in 2000 when she joined an SSP self help group. She started to interact with other rural women and soon started to mobilize self help groups across the village and beyond. She gained insights into the financial, health, and agricultural challenges her community faced and was soon working towards their solutions. Within one year, Godavari founded the first women's federation to work on women's economic and leadership development. It currently has more than 5000 members. After the severe drought in the Marathwada region in 2012-15, as a solution to combat the rampant crisis, Godavari mobilized more than 1000 women farmers to come together in collectives and grow vegetables and food crops to improve food security. For a woman who can speak only her mother tongue fluently, Godavari has travelled to 16 countries for various global conferences and awards. In 2011, Godavari represented grassroots women’s networks in India at the UN-CSW in New York. She represented grassroots women leaders and farmers from SSP to receive the UNDP Equator Prize 2017 in New York in September. In 2012, Brazil, she showcased the critical role of grassroots women in sustainable development in Rio+20. Godavari was a panelist at the UNISDR, Geneva, 2013, to present the initiatives taken by rural women in times of drought. Godavari participated in the third UN World Conference on Disaster Risk Reduction in Sendai, Japan, 2015, and was the Global Ambassador to the UN in the IFAD and Huairou Commission on Rural Women in Sustainable Agriculture, a global initiative. For over 2 decades, Godavari has been working in women's development. "Godavari and rural leaders like her inspire us every day to combat global challenges locally," says Prema Gopalan, Founder of SSP. "These ordinary women who lead change don't isolate themselves. Their strength is their collective." "My association with SSP educated me, and transformed me from a grieving widow to an empowered leader," says Godavari. "It is your right to learn," she adds, "and it is your duty to teach others." Kamal Kumbhar from SSP has received the 2017 Woman Exemplar Award of CII Foundation in the Micro enterprise category from the Honorable President of India, Shri Pranab Mukherjee. A proud moment for all of us !!! SSP honored over 150 grassroots women leaders on International Women’s Day and the week as part of our 1000 women strong gatherings! The Economic Times 4th Annual Rural Strategy Summit was held on the 23rd of September in Mumbai. This is the most exclusive annual gathering of the leading stakeholders working across different industry sectors in the rural domain, coming together to discuss, deliberate and analyze the latest trends in the sector, in a disruptive an ever changing environment. Upmanyu Patil, Swayam Shikshan Prayog was a speaker at this event. Swayam Shikshan Prayog has been selected as one of the key implementing partners under HSBC Skills For Life program. HSBC Skills for Life is a five-year INR 1 billion (£10 million) commitment by HSBC India that will support NGOs in India to provide employment and entrepreneurship-linked skills training for disadvantaged young people and focus on livelihood enhancement and financial education of women. SSP was selected as one of 16 partners to implement the program in Maharashtra from over 800 NGO's across across 28 states in India in July 2016. SSP will train over 350 adolescent girls in entrepreneurship and vocational skills in Marathwada region of Maharashtra. Ms. Prema Gopalan, a speaker on the panel Intern-linkages between Energy Transitions and Gender at the first India-Africa Women’s Forum to address how women's equal and active participation can be encouraged in various areas. Chennai played host to a panel discussion on ‘Crisis and Gender’, with experts in the field from across India interacting with the participants. The discussion followed the launch of the book ‘Women and Disasters in South Asia: Survival, Security and Development’. 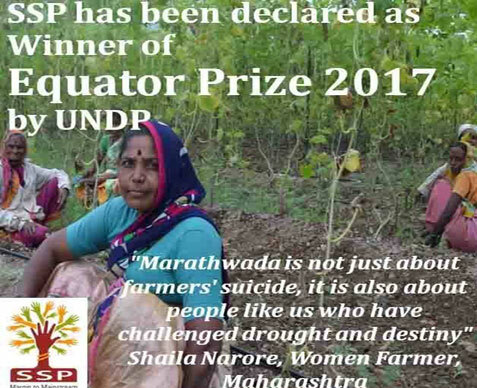 Learn about how SSP supported by Misereor Germany and Huairou Commission in partnership with thousands of women farmers mitigated the impact of drought in Maharashtra, India through this powerful photo essay by Atish Patel. Learn about ​the ​wPOWER program ​led by Swayam Shikshan Prayog ​(SSP) ​supported by the US Department of State and USAID ​/India that's empowering rural women and helping to bring about a greener tomorrow. The Better India and TOI has featured our women leaders and highlighted SSP's efforts. Women in drought-hit Maharashtra prove they’re better farmers by bringing home the food and keeping suicides at bay. 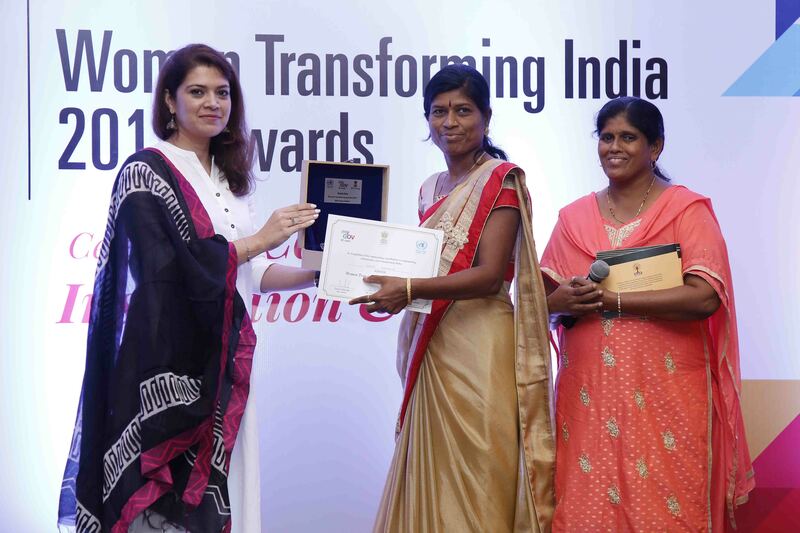 The Schwab Foundation for Social Entrepreneurship in partnership with the Jubilant Bhartia Foundation selected Ms. Prema Gopalan as one of the four finalists of the India Social Entrepreneur of the Year Award, 2015. Osmanabad, Latur and Beed districts in Marathwada region of Maharashtra are facing the worst ever drought of the century. The Swayam Shikshan Prayog has empowered women as decision makers and changemakers in this situation. Prema Gopalan, Executive Director of SSP featured on Mint in an article- Empowering Rural Women to Provide Health Services where she speaks about the Arogya Sakhi Program of Swayam Shikshan Prayog which trains landless women to provide basic health services at affordable prices. Swayam Shikshan Prayog was awarded the 6th mBillionth South Asia Award 2015 under the M-Health Category on July 23 2015, New Delhi, India. SSP received the award for its technology enabled project being implemented in partnership with Sofomo Embedded Solutions Pvt. Ltd for "Arogya Sakhi. ICIMOD invited Mr. Laxmikant Malvadkar as SSP representative to deliver flood preparedness training of trainers to Nepal organizations. The two days TOT and 3 days village meetings were conducted from 27th June to 5th July in TRIYUGA region at Gaighat of Nepal. The project aims to cover 150 women act as climate change leaders from Latur, Osmanabad and Nanded districts, Maharashtra and contribute with their community. The first round of Training held at Latur on 25-26th June, 2015 was participated by 17 women leaders. Ms. Prema Gopalan with the British High Commissioner and Hon Minister Maneka Gandhi at an event at Delhi to celebrate the launch of Young Women Social Entrepreneurship Development Program Phase II and the reception at his residence on June 25, 2015. NGO information repository and first place to look for NGOs in India with searchable database of reliable and comparable information on over 6,500 NGOs. Search allows users to find and connect with NGOs within minutes. Swayam Shikshan Prayog (SSP) has won the Best Innovation: Social Entrepreneurship and Inclusive Business Models awarded by the Maharashtra State Rural Livelihoods Mission (MSRLM) at the Maharashtra Rural Livelihoods Innovation Forum (MRLIF) on 27th January, 2014. MSRLM through the MRLIF aims at partnering with organizations that go beyond income generation activities and employment programs to include capacity building, financial inclusion, social mobilization and marketing services which are important elements of livelihoods enhancement. MRLIF is a forum which recognizes such innovations in areas of social and financial inclusion, livelihood and sub sectors, social entrepreneurship and inclusive business models. The award was presented to the Founder and Director of SSP, Ms. Prema Gopalan by eminent dignitary, Shri Jairam Ramesh, Honorable Minister for Rural Development. SSP was selected as the finalist amongst 38 finalists shortlisted from over 400 applications in Maharashtra. SSP shall partner with MSRLM to scale up its impact in Maharashtra by employing a co-creation model for the BoP that allows rural women entrepreneurs to directly collaborate with private corporations through our recently established Clean Energy Hub -an innovative platform designed to provide a one-stop-shop to the private sector for accessing the rural market and significantly improve clean energy access through the network of Sakhis. Swayam Shikshan Prayog (SSP) has won the Best Innovation: Rural Energy Sector awarded by the Bihar Rural Livelihoods Promotion Society (BRLPS) at the Bihar Innovation Forum (BIF) on 31st January, 2014. The Bihar Innovation Forum is an initiative of the Government of Bihar supported by the World Bank and implemented by the Bihar Rural Livelihoods Promotion Society (BRLPS) in collaboration with the State Innovation Council. SSP was one of the 67 finalists shortlisted from 2000 applications received on a Pan India basis. The award was presented to the Program Director of wPOWER project in SSP, Mr. Upmanyu Patil and the Team Leader of Entrepreneurship Training Program, Mr. Laxmikant Malvadkar by eminent dignitary, Shri.Nitish Kumar, Honorable Chief Minister, Bihar. The Bihar Rural Livelihoods Promotion Society shall partner with the winners to replicate and scale up their innovation in Bihar by facilitating access to Human Resources, Investments and Credit, Economic Capital and Last Mile Delivery Support. SSP seeks to partner with BRLPS and other private and public corporations in Bihar to employ a co-creation model for the BoP that allows rural women entrepreneurs to directly collaborate with private corporations through our recently established Clean Energy Hub -an innovative platform designed to provide a one-stop-shop to the private sector for accessing the rural market and significantly improve clean energy access through the network of Sakhis. SSP organized a global peer learning exchange in partnership with Huairou Commission in Osmanabad from 26 to 28 May 2018. Twenty-one women leaders from 14 countries participated in the event. This event was an opportunity for women leaders from across the globe to learn from grassroots practitioners living in drought-prone areas of Maharashtra. These grassroots leaders, facilitated by Swayam Shikshan Prayog (SSP) have organized large constituencies of drought-affected grassroots women, used the Community Resilience Fund to nurture and scale up innovative practices, and leveraged resources from government institutions. The visiting team got a clear understanding on the one-acre model, and how diversified farming helped in reducing the damage that can be brought by pests and ensures the availability of food for the family. The partnerships made with their local authorities, especially with the ministry of agriculture in addressing the issues of the villages and recognition given by them to SSP and women leaders will have better impact on communities. Women now make the decision on how the money from their businesses will be used; they have control over their income. “These grassroots innovations have provided us with an alternative system with more sustainable forms of production and consumption. Hence, we will certainly adopt this co-evolutionary understanding of socio-technical innovation which has provided Ntengwe with radical niches as potential sources of new ideas and solutions,” remarked Elisabeth Markham. The visiting team was impressed with the risk mapping organized in Ansurda village. This was a very good exercise according to the visiting team. It provides an opportunity to identify the risks from water to economy, migration and food insecurity, gaps in policy implementation, infrastructure mapping, soil PH testing, capacity assessment etc. The Latin American team felt that women became the protagonists of change, and now they are recognized by the authorities and by the private initiatives as social actors of change. On 28 May, the peer learning team also met the District Government Officials in Osmanabad and interacted with them. They learned about how SSP and women leadership is working with government authorities to reduce the risk in agriculture and drought. Violet Shivutse, Global Chair of Huairou Commission said, "The partnership with local governments is very important to us. Grassroots women usually access information and resources from the local government and prioritize their need. Recognizing their leadership is a good sign for long term partnership." Sandy Schillen, Executive Director of Huairou Commission said, "We are very happy to see the partnership between the district government and women leadership in Osmanabad. We have learned from the practice how the leadership abilities of these women are growing with their practices and diversifying their initiatives." Swayam Shikshan Prayog. The focus of attention was grassroots women-led initiatives in sustainable livelihoods, and food security. Women leaders from Community Women’s Forum (CWF) and Lumanti, Nepal visited Maharashtra to learn about successful entrepreneurship initiatives, community funding systems, women leadership and local partnership. The objectives of the visit were to learn about how SSP’s intervention helped in rural sustainable development and also know more about the initiatives taken by women groups on entrepreneurship development and livelihood standards. The event saw the knowledge exchange of the existing practices of women groups in organizing, mobilizing, scaling up, expanding the network, and strengthening the women’s community, which will eventually help in community development and economic empowerment. The women leaders also evaluated different replicable and adoptive models on entrepreneurship. The field visit covered villages like Dongaon, Chare, Khari, Ansurda, and Hinglejwadi, in Maharashtra. The Nepal team met with successful women entrepreneurs and discussed their business strategies, import/export opportunities, marketing methods, and setting business plans and goals for the future. The visiting Nepal team observed that proper training on business given by SSP/women federation and support from government/banks are strengthening and systemizing small businesses with a plan. Training sessions on credit and product display, and awareness about the products in demand benefit the women in increasing their profit. They also participated in the training programs for women leaders in making bio-pesticides. After the field visit, a feedback session was organized at SSP office which was facilitated by our Sakhis; Naseem and Godavari. The Nepal team identified different innovations and initiatives, which they can replicate in Nepal and categorized them into groups. The one thing that was clear from this learning exchange forum was that SSP’s training programs on entrepreneurship empowers women by promoting resilience. SSP's project “Rural Community Leaders Combating Climate Change” is one of the 13 Projects from Across the Globe to be Honoured at UN Climate Conference taking place at the United Nations Climate Change Conference (UNFCCC) in Marrakech, Morocco, from 14-18 November 2016. These events include an Oscars-like awards ceremony and a thought-leadership event where we are invited to present our activity to various stakeholders attending the conference. Debriefing workshop and discussion of findings from the Nutrition study conducted by the Misereor Research Team Study on One-acre model, the sustainable agricultural practices model promoted by Swayam Shikshan Prayog was held on August 2-6, 2016. The workshop brought out interesting leanings, reflections and recommendations from women farmers and stakeholder. Clearing Corporation of India Limited (CCIL) granted support towards SSP’s programs targeted at drought relief in Marathwada region in Maharashtra. The project will reach out to 2000 ?small and marginalized women farmers ?across 20 villages Latur district. Further entrepreneurship development and livelihood diversification workshops will be conducted for 100 women across the villages. Targeted information campaigns for drought mitigation, water conservation structures, low cost input farming methods, water efficient crop cultivation, access to government schemes for employment, MREGS, tree plantations, etc will be organized by grassroots women leaders or Samvad Sahayaks in every project village. These women leaders will play a key role as community advocates and catalyze collaborations between women farmers and local government institutions to transfer the information/knowledge and services. SSP has mentored several women who have gone on to win national awards. One of them, Godavari, spoke at the United Nations General Assembly though she hadn't even passed high school. Priyanka, a young widow from Osmanabad, in turn has resolved to empower at least 100 widows in her area. Read the full article published by India Today. Our women farmers, Vaishali Ghuge, Archana Mane, and Archana Bhosle, along with others, are turning drought into an opportunity for change. They are an inspiration to millions. Read their full-page coverage story on Loksatta newspaper here. The Schwab Foundation for Social Entrepreneurship, the sister organisation of the World Economic Forum and the Jubilant Bhartia Foundation of Jubilant Bhartia Group honored Prema Gopalan of Swayam Shikshan Prayog as the winner of the Social Entrepreneur of the Year India 2018 Award. The women-led climate-resilient farming model created by Swayam Shikshan Prayog in drought-hit Marathwada has yielded encouraging results and is worthy of emulation across the country. Read the full article published by Frontline. Kamal Kumbhar, a serial entrepreneur from SSP received `Women Transforming India Awards 2017' from Wing Commander Pooja Thakur at the Award Ceremony held on 29th August, 2017 at India Habitat Centre, New Delhi. The award was launched by NITI Aayog, in partnership with United Nations in India and MyGov. Prema Gopalan, Founder and Executive Director of Swayam Shikshan Prayog India has been awarded Women Change Makers Fellowship 2017 by the Womanity Foundation. The WCM Fellowship aims to identify, support and connect leading social entrepreneurs, who are addressing women’s access to education, healthcare as well as economic and political participation. It is the only Indian organization to win the award, making the cut from more than 800 nominations across 120 countries. The aim was to empower the women in a way that they are able to manage the available natural resources and achieve food and income security through agriculture. SBN Maharashtra News channel broadcasted the news on Government of Maharashtra funded `Start Up Village Entrepreneurship Program’ (SVEP), under which 5000 women are being trained as entrepreneurs. Under the umbrella of National Rural Livelihood Mission, SSP is partnering with the Govt of Maharashtra to implement a scaled up program for small and marginal women farmers and creating women entrepreneurs across three districts in Maharashtra. Godavari Dange and Nirmala, the grassroots community leaders from SSP with Ms. Vijaya Rahatkar, Head of Maharashtra Women’s Commission at the Western Region Consultation on “Securing Rights of Women Farmers: Developing a Road Map for Action” was held on 8-9 May 2017 at YMCA Pune. Kamal Kumbhar a grassroots serial entrepreneur supported by Swayam Shikshan Prayog is Winner of the 2017 Woman Exemplar Award of CII Foundation in the Micro enterprise category... she has received the Award from Honorable President of India, Shri Pranab Mukherjee. Sakhi Melava, Solapur 9th March, 2017 & Opening ceremony of Women Entrepreneurship and Leadership Resource Center. On the occasion of International Women's Day on 8th March 2017, SSP felicitated grassroots women leaders in addressing development issues of rural communities in the Sakhi Melava organized by SSP at KVK, Latur. In an era where the focus is highlighted on ambitious clean energy initiatives by big companies, Swayam Shikshan Prayog has been recognised by the un for its efforts in bringing the same initiative in smaller doses to rural areas. Grassroots women leaders Naseem Shaikh and Dange Godavari from Swayam Shikshan Prayog India meets Member of Parliament Mr. Uwe Kekeritz during their visit from 17th to 24th October, 2016 in Germany. The Member of Parliament Mr. Kekeritz, Germany who had invited Misereor and SSP grassroots leaders for the parliamentarian breakfast has published a long version on the meeting on his website.